Expectations are low for Apple's recently concluded March quarter, in which some market watchers believe the company likely saw its first year-over-year profit decline in a decade, despite booming sales of its iPad lineup. On average, analysts polled by Thomson Reuters expect Apple to report revenue of $42.49 billion with earnings per share of $10.07. In comparison, a year ago the company made $12.30 earnings per share on sales of $39.19 billion. Record iPad sales are expected, while the iPhone may also reach new March quarter highs. But investors also expect Apple's profits to shrink year over year for the first time in a decade. The last time Apple saw a year over year decline in profit was in 2003. The company will report its March quarter results after the markets close on Tuesday, followed by a conference call scheduled for 5 p.m. Eastern. Sales of the iPhone are expected by Wall Street to be about flat from last year, but they could still set a new record. A year ago, Apple sold 35.1 million iPhones, its best-ever number for a March quarter. This year the market has a consensus expectation of 36.4 million units, which would be a new March quarter record, according to Chris Whitmore of Deutsche Bank. Shaw Wu of Sterne Agee is less optimistic, as he believes market consensus is at 34 million iPhones  a number that would instead represent a year over year decline. Wu himself is forecasting for Apple to have sold just 32.5 million iPhones. However, Apple's other key product lineup, the iPad, is expected by investors to break records for the March quarter. Consensus calls for Apple to have sold between 18 and 19 million iPads, according to Wu, which would be a significant increase from the 11.8 million Apple sold a year ago. As for the Mac, Wu said market consensus is calling for 3.8 million to 3.9 million units. Apple's March fiscal 2012 quarter saw sales of 4 million Macs. Tuesday's earnings report will be of particular interest to investors because it will be the first time the company discloses its sales under its new, more realistic guidance strategy. After giving the market overly conservative guidance for years, the company announced in January that it it had overhauled how it would forecast upcoming quarters. Tuesday's earnings will mark the first reported by Apple under its new, more "realistic" guidance. The changes were made in an effort to thwart what had become excessively enthusiastic analyst expectations. Apple's previous guidance reflected numbers the company felt it had a reasonable chance to exceed, while the new guidance instead reflects what company officials believe Apple is likely to achieve. Back in January, Apple guided sales of between $41 billion and $43 billion for the March quarter. Apple's guidance for the following June quarter could also be telling. The company has yet to launch a major product in 2013, and many investors are eagerly awaiting the company's next moves, with some speculation that a new fifth-generation iPad could launch in the near future. Speculation has also suggested that Apple will launch its next handset, a so-called "iPhone 5S," earlier than in the past few years. Some reports have pegged an "iPhone 5S" launch for July, which would be less than a year after the September 2012 debut of the iPhone 5. Finally, there's also the question of how much potential bad news is already "baked in" to Apple's stock price. Some believe if Apple's March quarter earnings miss estimates, investors won't be surprised and the stock may not take much of a hit. The company's stock price first dipped under $400 last week after a key component supplier reported weak results for the March quarter. 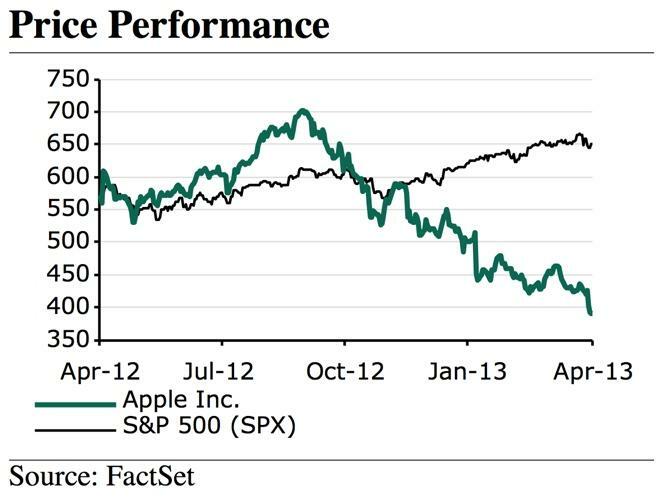 Shares of AAPL have tumbled more than $300 from their highs seen last September, ahead of the iPhone 5 launch.